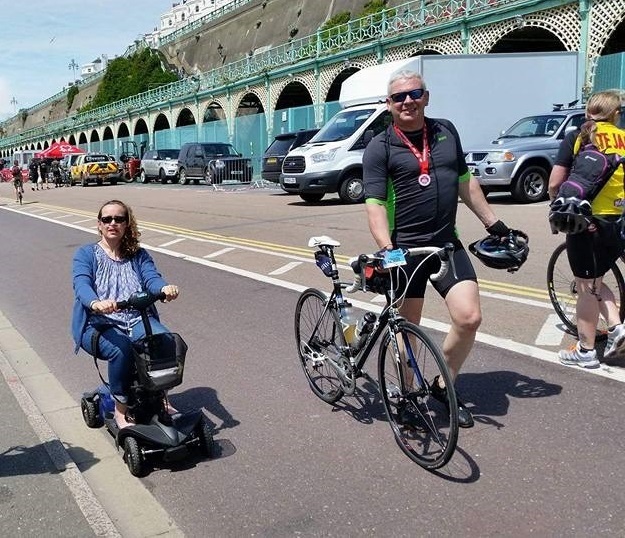 Charlotte Goldthorpe looks at how mobility scooters are giving some PH patients back their independence, and considers what you need to take into account when making the decision to climb on board. Using an electric scooter can make a great deal of difference to your quality of life, enabling you to get around independently. Like most vehicles though, they don’t always come cheap, with prices ranging from £400 for basic models, up to over £5,000 for top-of-the-range machines. It’s also possible to buy them second-hand. The good news is there’s a charity scheme which can help people who are receiving the highest rate for the mobility component of their Disability Living Allowance (DLA). Motability, which has affiliations with many motorised scooter retailers across the UK, enables people to get mobile by exchanging their allowance to lease a mobility scooter, car or powered wheelchair. PHA UK can also sometimes provide small grants to assist with equipment like mobility scooters. Gill out and about on her lightweight scooter. This protects other people, vehicle and property in the event of an accident that was deemed to be your fault. This covers you for the above, plus fire or theft of your own scooter. This will cover you for all of the above, plus damage to you and your own vehicle/ property which is caused by you. Over the past few years it has been argued that it should be compulsory for those driving mobility scooters to be insured. However, as it stands, there is no such law. Owners of mobility scooters are advised to get insured to cover themselves in the event of an accident, theft or damage to their scooter. There are a number of mobility scooter insurance companies on the market including Fish Insurance, Surewise.com and Blue Badge Mobility Insurance. When filling out the details for insurance, generic questions such as name, address and the type of scooter you own will be asked. No matter where you are or what you are doing, accidents can and do happen. Through being insured, it will eliminate the fear of facing a costly legal battle if anything was to go wrong, or having to pay for a new scooter, and give you piece of mind when out and about on your scooter. The Highway Code sets out rules for the use of mobility scooters on roads and pavements. ‘Class 2’ vehicles are those with an upper speed limit of 4mph and are designed to be used on pavements. ‘Class 3’ vehicles are those with an upper speed limit of 8mph and can be used on the road as well as the pavement. However, they must not travel faster than 4mph on pavements or in pedestrian areas.